Let every roadside diner be judged not by the potholes in the road out front, but by the size of its plates and the crispness of its Spam. Located in Harmon Industrial Park, The Cafeteria is hailed by foodie Facebook friends and barflies alike. A quintessential place to go for local food, The Cafeteria may be off the beaten path, but it’s probably not too far out of your way. When she got married to a Chamorro, head chef and Korean native Aileem Euh Cruz learned how to cook all of her husband’s favorite foods with plenty of love and pepper. 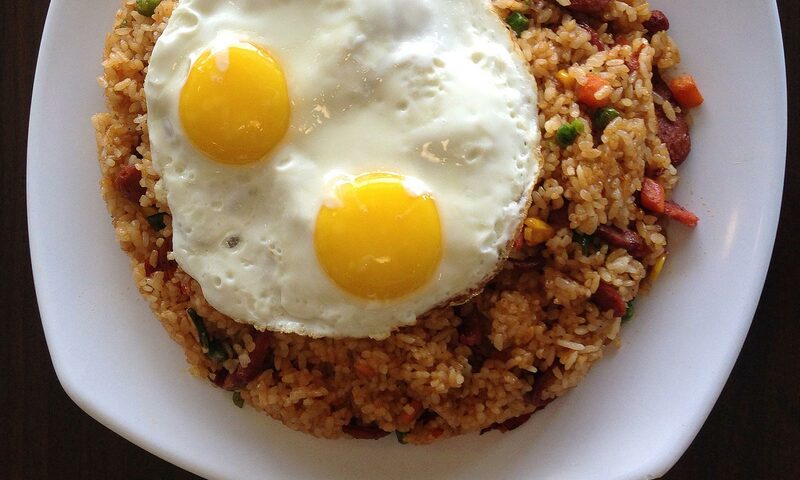 You typical Chamorro breakfast can be made with just three ingredients: rice, meat, and egg. 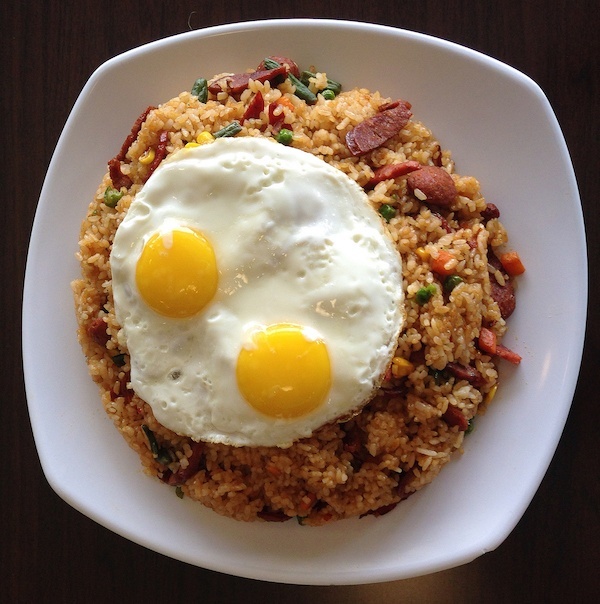 For those who can’t decide between hot link, Chamorro sausage, and chorizo espanol, the Mata’pang fried rice has it all. It’s easy to get lost on this mountain of rice between plateaus of crunchy carrots and corn, but the crowning glory are the fried eggs draped over the peak. Absorbing greasy goodness from the meat, the rice takes on the rich, buttery flavor of a hash, a perfect compliment to the crispy thin nuggets of meat. This hearty, industrial-sized Breakfast of Champions is meant to fuel you through a work-intensive morning, but it might also make you want to go back to sleep. Dish is big enough to share with one or twelve of your cousins. 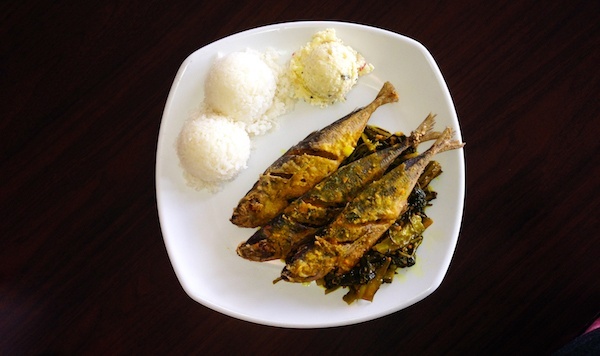 Atulai, called mackerel elsewhere, is a salty but mild fish that becomes deliciously crisp when fried. Marinated with a sauce of vinegar and turmeric, the fish are served on a bed of crunchy onions, local kang kong, cabbage and carrots fried in the same sour sauce and lightly pickled in flavor. Unlike a lot of Chamorro food, escabeche is neither sweet nor spicy, but plays on flavors of salty and sour, which in the right balance are equally addicting. This savory delicacy is served with white rice and a creamy, scoop of potato salad. This is not a fluffy fish stick, but three whole fishes, served with the head on and mouth open. If you’ve never had this before, the eyes and skin are fantastic, but be careful as you pick out the bones. Although you have to work a little for the meat, every bite is worth it. Also recommended: Chicken estufao, a mild soup comparable to adobo or kadon pika without the pika. The pepper on top should serve as a warning that this is not for the faint of tongue. Pika is Chamorro for hot, and the Cafeteria’s authentic Kadon Pika ain’t playing around. This soup is as hot as I’m willing to go – but for you few brave explorers of pain who seek to push your Scoville scale threshold, just mash up the pepper on top and see what happens. In this dish, meaty chunks of chicken are slow cooked in a spicy broth of vinegar and soy sauce, until the meat is ready to fall off the bone. 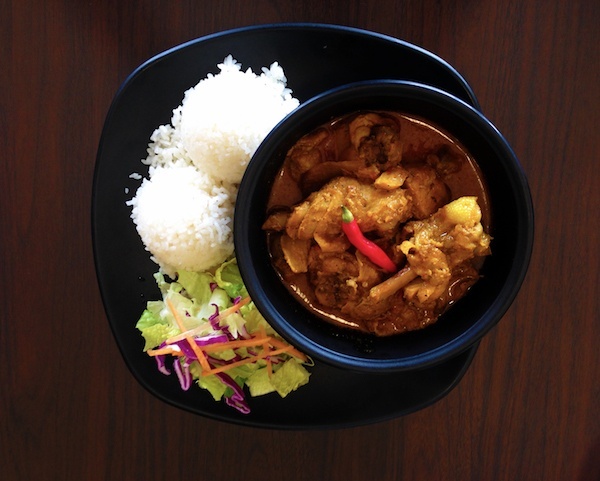 Kadon pika is similar to a spicy version of adobo, actually made with the same ingredients in different ratios. A simple soup with a spicy, savory flavor, I truly believe kadon pika is the cure for the common cold. By popular demand, the brunch place will be extending its hours starting April 1 to serving dinner from 5 to 9 p.m.